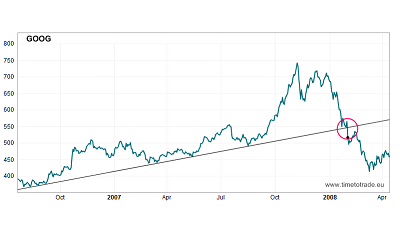 New Trend Line Alerting tool helps investors and technical traders ride market trends. 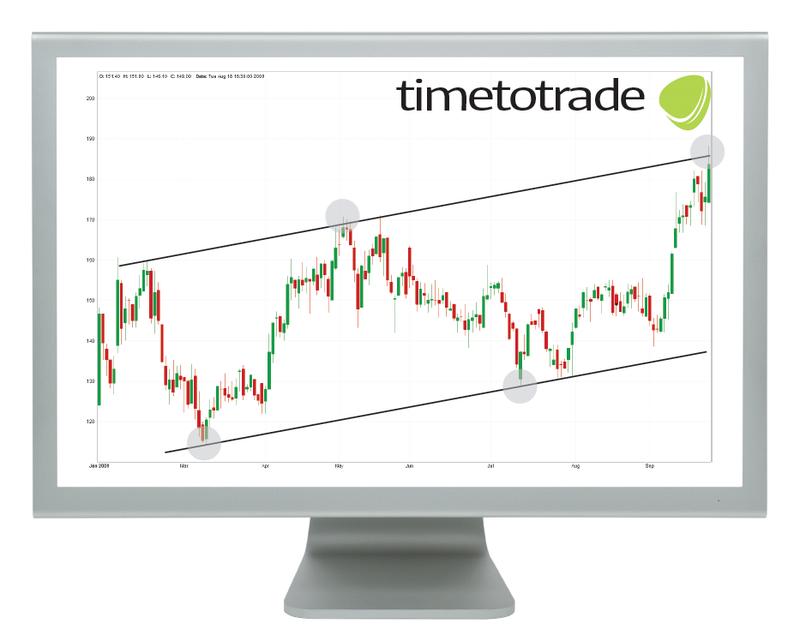 timetotrade's trend line alerts track real time movements of shares, foreign exchange pairs, indices and ETFs. When price breaks out above or below a defined trendline investors receive alerts to their mobile phone, email and instant messenger - so there is no need to miss another trading opportunity. Throughout history, whether it's stocks or forex, commodities or indices, we see that the financial markets are ruled by trendlines. Today timetotrade has launched "Trend Line Alerts" an exciting new charting tool for private investors which watches the market for you. The tool's "Point-and-Click" alert system is intuitive and easy to use. Investors simply select their chart (stocks, forex, indices and ETFs), draw their trendline and click an alert button. And that's it. timetotrade then monitors the charts letting investors know the instant price crosses the trend line. And for technical traders, the trendline alerts can be combined with a variety of technical indicators to create compound rules to give you a truly powerful edge on the market. For example, you can set up an alert to notify you when the price hits a trendline followed by the stochastic moving above 20 and a MACD crossover. The web-based charting package allows investors to draw any number of wedges, channels and support and resistance levels for shares, forex, market indices and ETFs. Whether it takes an hour, day, week or year in to the future - investors will be notified the minute their alert triggers. Alerts can be sent by email, instant messenger or SMS text to their mobile - so there is no need to miss a trading opportunity or to get caught out by the market again. As the timetotrade platform is web-based, there is no software to download which means it can be accessed from any computer or web enabled device (including i-phone or blackberry). Investors can monitor up to 5 alerts at any time for free, or subscribe to timetotrade's Active package for 100 alerts (£9.99 per month) or the Pro package for unlimited alerts (£19.99 per month). Dary McGovern, Managing Director of timetotrade commented "Whether you're looking to buy into rising uptrends, or to sell short the market to the downside, trend lines give important visual clues about the direction price is moving. Timetotrade's trendline and technical analysis alerts mean you never have to miss that breakout, or take another loss just because you weren't sat in front of your computer. Ultimately, they keep you ahead of the curve and help you make more money." Trend lines are one of the most simple and widely used tools of technical analysis to help followers judge entry and exit timing. The basic principle is that investors can make profits from riding chart trends to higher highs or lower lows. To quote Jesse Livermore, one of the most successful traders of all time, "Successful traders always follow the line of least resistance. Follow the trend. The trend is your friend." And time and again, we see his famous words hold true. For example, if we look at a chart of the Google (GOOG), the moment Google broke below its bullish trend channel back in February 2008 (see attached image) gave an indication that all was not well, and provided a warning to traders to liquidate their positions. Trend lines are formed when you can draw a horizontal line between two or more price pivot points. Two common types of trend line are Support and Resistance. Support is the level at which buyers control the prices to prevent them from falling and resistance is the level at which when sellers control the prices and prevent them from rising higher. Resistance can become a support if the price of the equity increases above the resistance level; similarly a support level can become a resistance level if the price of the equity falls below the resistance level. Trend lines are used in many ways by traders. If a stock price is moving between support and resistance trendlines, then a basic strategy commonly used by traders, is to buy a stock at support and sell at resistance, then short at resistance and cover the short at support. The logic being that when the price returns to an existing trendline it may be an opportunity to open new positions in the direction of the trend, in the belief that the trendline will hold and the trend will continue further. Watch our video and find out how to use timetotrade Trend Line Alerts click here. Technical analysis is the statistical study of a security's price movement through the use of charts. Investors look for patterns on charts to help determine a security's future performance and exploit this information to make money whilst avoiding losses. Technical analysis has become increasingly popular over the past several years, as more and more people believe that the historical performance of foreign exchange, stocks or futures is a strong indication of future performance; therefore becoming a self fulfilling prophecy..
timetotrade is a financial technology company who develop online trading tools for private stock market investors, forex traders and investment clubs.